Transfer gossip involving Zinedine Zidane taking the Manchester United job and putting his own stamp on the squad is really hotting up at the moment. There’s been huge amounts of talk that the Frenchman is confident of replacing Jose Mourinho at Old Trafford, and it seems he’s already making huge plans for when he gets control of the team. Zidane was a massive success in three years at Real Madrid, winning three Champions League titles and La Liga in that time, and at this moment he looks a potentially massive upgrade on Mourinho. MUFC may well want to give him whatever he wants – and fans will be excited to see his plans involve raiding Chelsea for two of their best players. According to Spanish source Don Balon, Zidane is making Eden Hazard and N’Golo Kante two of his prime targets for United. This would be an incredible double deal, likely to cost in the region of £250million altogether, but one that could work out amid doubts over Hazard’s future in particular. The Belgian would be an ideal upgrade on Alexis Sanchez, who has majorly flopped at United since his January move from Arsenal. Eden Hazard and N’Golo Kante to Manchester United under Zinedine Zidane? Kante, meanwhile, could also be an ideal player to come in and fill the void left by Paul Pogba, who is being strongly linked with Barcelona, Real Madrid or a return to his old club Juventus after becoming unhappy in Manchester. An alternative to Hazard could also be Antoine Griezmann, who’d cost a similar fee and whom CaughtOffside understands Zidane has already spoken to about a move. 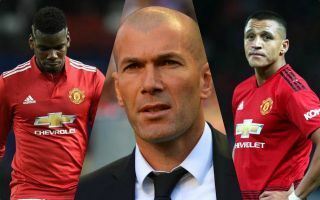 It comes as little surprise therefore that Zidane is making replacing Sanchez and Pogba a top priority for when he replaces Mourinho in the Red Devils hot seat.